Apple.inc announced iOS 8 to be released on 2nd June this year.It will be released along with Mac OS X 10.10.Apple is planning to release iOS 8 on the World Wide Developers Conference to be held between June 2 to June 6. A whole new Notification Centre which makes accessing the Notifications simpler and more convenient.The Notification Centre is divided into two tabs,“Notification” and “Today” which simplifies the setup. An independent iTunes Radio app is announced to be a part of iOS 8.Apple proclaims that Radio inclusion in iTunes will promote the music services across the countries. Apple Maps and Indoor Navigation are likely to be updated,making them more precise and accurate. The Photo Stream creates real photo backup service that syncs photos to iCloud all the time. Apple Healthbook creates the way to gather information’s regarding fitness and medical treatments. iOS 8 also brings refinements to iMessage ,Game Centre,Car Play,etc. The Company also mentioned that iPhone 6 which will feature iOS 8 will be announced in the WWDC on June 2. 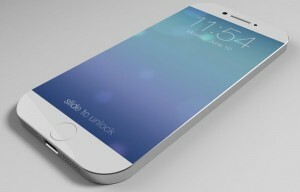 Apple also revealed that the new iPhone will come in two different sizes,one a “5.5 inch” and other a “4.7 inch”. No official announcement regarding the release of the smartphone has been confirmed yet! Previous articleDid you know that you don’t need to search for ebooks anymore? Hmm…….seems interesting. Very nice and informative.